This information was first posted on collectSPACE. [Tom Steiner] When collectors think of rocket launches they normally think of covers created for the launch itself. An interesting sideline to collecting the launch covers is to collect launch security covers. For each launch a Notice to Airmen (NOTAM or NoTAM) notice is filed to alert aircraft pilots of potential hazard of the rocket launch along a flight route or at a location that could affect the safety of the flight. Similarly a Notice to Mariners is filed for navigational safety. For Kennedy Space Center, Cape Canaveral AFS or other Eastern Test Range (e.g. submarine launches) launches the flight crews from Patrick AFB are tasked with security of the flight path while the US Coast Guard Port Canaveral Station is tasked with the marine security. Covers for the security of launches can periodically be found. In reading about launch delays within the launch window there seems to be more mariner delays for vessels in the restricted area than aircraft. [DOX32] Tom, how do you know these are launch security covers? Is there anything on the back of the cover? [Ken Havekotte] The U.S. Coast Guard cutter Point Charles (WPB 82361), featured on some cover depictions here, was stationed at Cape/Port Canaveral from 1967-88. To use a term for it as a "launch security" cover may be misleading a bit, in my opinion. The ship's purposes were many-fold during a shuttle launch, however, the 82-foot-long patrol boat with a crew of eight aboard did help to control law enforcement in and around the Cape/Port areas. But the primary assignment of the USCGC Point Charles throughout her career on the waters of the Florida Space Coast was mainly aerospace-related search, rescue and recovery operations. It was an unusual task for a coast guard vessel, however, in-between rocket and missile shots from the Cape, the Point Charles did perform more routine maritime operations. For instance, in March 1968, she had towed the disabled F/V Scalaweg about 80 miles west-southwest of Key West to safe waters. Another point to possibly consider were the address line-type rubber stamps that we see applied at top left on many covers like this. If I recall, going back to the early shuttle program of the 1980s, not all of the rubber stamps used on covers like this were in fact originated from the designated ship(s) they pertain to, or even at their port-assigned stations. It's my belief that some such covers with coast guard and other involved ship affiliations that we see with rubber stamp addresses — were in fact — commercially produced by space cover dealer(s). But I am not, of course, implying that ALL coast guard ship return-address markings that we see on many similar space covers are not genuine. For sure, many/most are indeed authentic. [Tom] Ken/Woody - I had received one of these covers for a shuttle launch from Bob Boudwin who had serviced covers since the early 1960s. Always interested in the tracking and recovery ships I made a phone call to the USCG station at Port Canaveral and asked them about their role in the launches and I referenced that I had seen covers for various space launches. The person at the station I talked to was the one who made reference to USCG cutters role as "launch security" and described the role of security and search/recovery if something were to happen during the launch. He also told me they were involved in every manned mission and all most all unmanned missions from KSC and Cape Canaveral AFS. 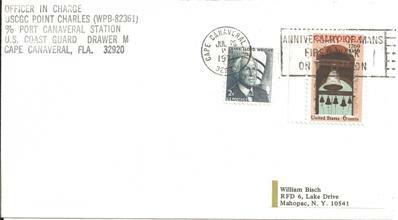 He told that there were several cutters that participated in this role besides the USCGC Point Charles (e.g. USCGC Point Roberts out of Mayport) so I should send my covers to the USCG station at Port Canaveral and they would have the cutter assigned to the mission apply their corner card and/or cachet for the mission. I did this for many of the shuttle missions. 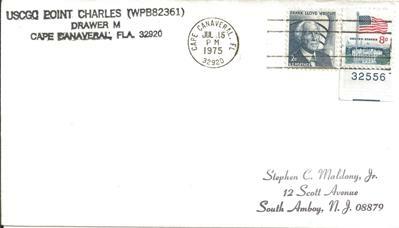 The USCGC Point Charles corner card on the ASTP cover is the same as the ones I received sending to the USCG station for the shuttle launches so I know that is the real one. I agree with Ken that many USCG cover corner cards are "dealer made" especially for the Skylab missions.